We just did a show in Sherbrooke for a youth group. We're hoping to play the Pre-Spring Thing in March or April, but that's still in the works, so we'll keep you posted. YC is also still up in the air, and we're still waiting for the official word on who's going to be playing at that! It's done!!! Copies are 10$!!! You can pick'em up at the shows!!! 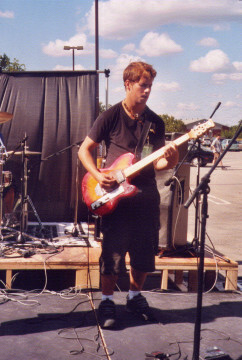 Also, we might be recording some of our newer stuff in the the early months of 2004. We'll keep you posted on it. Well, now that we've recorded the songs that we already have, it's time to start on new material. If you guys have any ideas for songs, let us know. God never ceases to inspire! We're probably going to change the style a little, but we're planning to move in new directions. Thank to everyone who's helped us out at shows, for the website, and all you's who've come to the shows!!! Special thanks go to Steve Rolfe at ABR audio for recording -title here- and interest in future projects! Thanks EVERYONE!! !